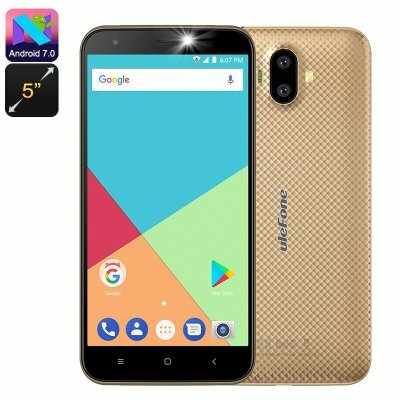 Successfully Added Ulefone S7 Android Smartphone - Quad-Core CPU, Dual-IMEI, 5-Inch Display, 3G, Android 7.0 (Gold) to your Shopping Cart. The Ulefone S7 smartphone is a remarkably cheap Android phone that allows you to enjoy all basic Android features at an affordable price. With its Android 7.0 operating system, this smartphone treats you to the latest software features the industry has to offer. You’ll be able to play basic games, watch films, and try out a wide-range of the latest Applications. With its Quad-Core processor and 1GB RAM, this Android phone will handle all basic tasks without dropping a frame. The phone supports Google Play, meaning that you’ll be able to easily install your favorite media onto your phone. With this cheap smartphone at your side, you’ll never have to be bored again. Dual-IMEI numbers bring along great connectivity. This Android phone allows you to stay connected to two network providers at once. This is especially useful for those of you who wish to separate work and private life into one smartphone or for people that often travel abroad. You will furthermore be treated to 3G connectivity. Thanks to this, you’ll be able to browse the web no matter where you’re at. Whether you’re at home, in the office or enjoying a day out on the beach – with the Ulefone S7 Android phone you’ll always stay connected. On the phone’s 5-Inch HD display, you can enjoy your favorite films and games in crisp 720p resolutions. The Android phone packs a whopping 2500mAh battery that brings along hours’ worth of usage time. Therefore, you won’t have to worry about running out of juice anytime soon. With 8GB or ROM and a 128GB SD card slot, this phone offers plenty of storage for you to keep all your files.